With further news of attacks on foreigners, and increasing numbers of foreigners being displaced in South Africa, I am reposting this article/review in the hopes that it will stir us to protect those who are South Africa’s guests. News reports today said that around 360 Malawians are stranded in South Africa having lost their homes and possessions including their passports. Thousands of foreigners are presently in transit camps. (14.4.15) Violence erupted in Durban and deaths have been reported. In May 2008 over 60 people were killed in a spate of violence aimed at foreigners who have settled in South Africa. The victims were not Europeans but, almost exclusively, African refugees. Shops owned by African foreigners were set alight, families attacked and many, who managed to escape death were left homeless and injured. The dawn of a free and new South Africa where the promise of ‘A better life for all’ is a real possibility, has generated some fears and protectiveness. And a new word entered the vocabulary of ordinary South Africans: xenophobia. Technically the word means fear of the stranger, but it has come to describe more than fear: it means violence against the foreigner. Recently, an even newer word has entered our vocabulary: Afrophobia, which, as it suggests, means a targeting of African foreigners. Since the undeniable success of the 2010 World Cup, when South Africans were such superb hosts to the nations of the world, the ugly threat of xenophobic violence has resurfaced. “If you’re not out by next week we’re coming to kill you!” was a statement from one South African man to two Zimbabwean women who were innocently walking with their children to a mid-week church meeting. History is important. We must learn from our history. And even recent South African history teaches us that refugees and foreigners don’t just come to take but also to give. That’s true of any nation – God moves people into new situations, he moves non-believers so that they might hear the gospel, and He moves believers that they might help build the church and encourage faith. Occasionally, a Daniel or a Joseph arrives in obscurity but rises to have a significant impact on the future of a nation. The story of George Bizos is the story of a modern day, secular Daniel. And it’s a compelling argument for anyone who is tempted to resent refugees, asylum seekers and foreigners, and think of them merely as spongers: because Bizos was an asylum seeker. 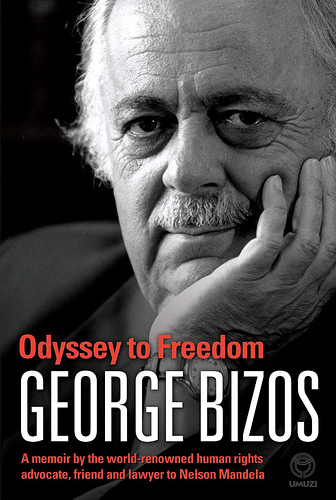 In his momentous autobiography, ‘Odyssey to Freedom’ (Umuzi/Random House) Bizos tells the dramatic story of the arrest, trial, imprisonment and eventual release of Nelson Mandela and other key leaders outlawed by the Nationalist government. The page-turning attraction of this superb book is the fascinating, insiders journey through courtrooms, bugged consultations, and private meetings with Nelson Mandela and the other ANC leaders. Bizos was a key, yet wonderfully humble, player in the legal process of the struggle for democracy in South Africa. Born in a small village on a Greek island, Bizos left his homeland and became a refugee in South Africa during the 2nd World War. His father arranged the escape of seven Allied Soldiers from occupied Greece. They fled to South Africa in a little boat. Thirteen year old George was on the boat with them. Bizos describes himself as a ‘below average pupil’. Securing only an E in English, Afrikaans and Science in his high school exams, but he battled on, retaking them and eventually entering Wits University to study law. He was admitted to the Johannesburg bar in the 1954. There are so many angles to his story: The Refugee who rose to become one of the Architects of democracy in South Africa, the Human Rights Lawyer who defended Mandela at the treason trial – helping him escape the death penalty, or simply a defender of the weak against the unimaginably powerful. His story is also a powerful example of how legal processes and expertise can help both defend and secure freedom even in extremely hostile and complex political contexts. He worked hard, retained his core commitment to human rights, overcame fear and developed friendships that ultimately drew him into a circle of men and women who helped break the stronghold of apartheid in South Africa. Here we see how a committed, careful, sometimes nervous, but principled group of men and women from within the legal profession kept chipping away, against all odds, at injustice until they finally emerged victorious. Throughout the book Bizos is clearly conscious of the blending of his Greek heritage with the drive for democracy in modern Africa. This cultural and ideological fusion is not far from the surface throughout and becomes, for Bizos, a celebration of the enduring contribution of Hellenic culture to modern civilisation. Bizos not only brings us close to the main players of the struggle for democracy in South Africa, he also represents the aspirations of the young nation. How is it, then, that we could turn so quickly from those good aspirations and descend into violence against the stranger in our midst? Christians have an additional impulse towards befriending and helping foreigners because of many exhortations in Scripture. Whichever country you live in, and how ever you may have felt about issues of immigration, the command to ‘Love your neighbour’ has come to you from Jesus Christ (Matt 22:39). All Christians should work for the protection of vulnerable foreigners. All South Africans, whatever their religious belief, have an example of the positive, community and nation-building contribution made to our nation by George Bizos, the refugee. It is examples like this which remind us of the fact that God has His hand on people, that He has a design for their lives. I understand and admire George coming from a Greek island only 5 years old in 1940 I saw the British soldiers escaping to Africa. We lived through the fifty million plus dead that make the present predicaments look like children s play.